After a period of relative neglect in many countries, apprenticeships and other forms of work-based learning are experiencing a revival. Their effectiveness in easing school-to-work transitions and serving the economy is increasingly recognised. However, engaging individuals, employers, social partners and education and training systems in such learning remains a significant challenge. 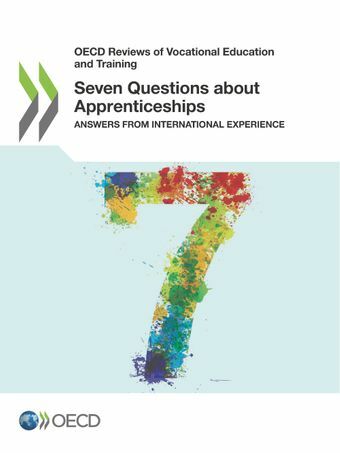 In light of this, Seven Questions about Apprenticeships draws out policy messages on how to design and implement high-quality apprenticeships, using material from the OECD project Work-based Learning in Vocational Education and Training.It presents answers to seven questions commonly asked by governments and practitioners seeking to either introduce or reform apprenticeship systems for young people and/or older workers. Can apprenticeships provide a useful contribution in every country? Should employers receive financial incentives for providing apprenticeships? What is the right wage for apprentices, and how long should an apprenticeship last? How can we ensure a good learning experience at work? How can apprenticeships be made to work for youth at risk? And how to attract potential apprentices?The study establishes principles of effective practice by building on new analytical work and examples of effective practice from around the world. Can apprenticeships provide a useful contribution in every country? Should employers receive financial incentives to provide apprenticeships? What is the right wage for apprentices? How to ensure a good learning experience at work? How to make apprenticeships work for youth at risk? How to attract potential apprentices?